True shrimp are swimming, decapod crustaceans classified in the infraorder Caridea, characterized by a body that is compressed from side to side, long antennae and legs, thin and semitransparent exoskeleton, lamellar gills, and fan-like tail. They are found widely around the world in both fresh and salt water. Together with prawns, shrimp are widely caught and farmed for human consumption, and are part of an important shellfish fishery. Ecologically, they are also integral to food chains, consuming phytoplankton and zooplankton and being consumed by various fish, birds, and mollusks (octopuses, squids, and cuttlefish). True shrimp comprise an infraorder with the subphylum Crustacea, a group of arthropods (phylum Arthropoda) that includes the familiar crabs, lobsters, barnacles, copepods, krill, water fleas, and crayfish. Crustaceans are characterized by having branched (biramous) appendages, an exoskeleton made up of chitin and calcium, two pairs of antennae that extend in front of the mouth, and paired appendages that act like jaws, with three pairs of biting mouthparts. They share with other arthropods the possession of a segmented body, a pair of jointed appendages on each segment, and a hard exoskeleton that must be periodically shed for growth. Shrimp belong to the largest class of crustaceans, Malacostraca, which includes the largest and most familiar animals, such as crabs, lobsters, shrimp, krill and woodlice. This class is sometimes arranged into the orders Decapoda, Amphipoda, and Isopoda, with the true shrimps part of Decapoda. (Some consider Crustacea to be a "class" and Malacostraca to be an order.) As their name implies, all decapods have ten legs; these are the last five of the eight pairs of thoracic appendages characteristic of crustaceans. True shrimp are placed within the infraorder Caridea, within Decapoda and Malacostraca. A number of more or less unrelated crustaceans share the word "shrimp" in their common name. For example, the fairy shrimp (which include brine shrimp) comprise an order (Anostraca) within the crustacean class Brachiopoda. Triops longicaudatus and Triops cancriformis are also popular animals in freshwater aquaria, and are often called shrimp, although they belong instead to the Notostraca (tadpole shrimp or shield shrimp), an order also within the class Brachiopoda. The mantis shrimp and the opossum or mysid shrimp belong to the same class as true shrimp, Malacostraca, but constitute two different orders within it, the Stomatopoda and the Mysidacea. As decapod crustaceans, shrimps share with crayfish, crabs, and lobsters the characteristic of having 19 body segments, which are grouped into two main body parts, the cephalothorax and the abdomen. Each segment may possess one pair of appendages, although in various groups these may be reduced or missing. There are typically eight pairs of thoracic appendages, characteristic of crustaceans. Decapods have ten jointed legs, which are the last five of the eight pairs of thoracic appendages. The front three pairs function as mouthparts and are generally referred to as maxillipeds, the remainder being pereiopods (walking legs). In many decapods, however, one pair of legs has enlarged pincers; the claws are called chelae, so those legs may be called chelipeds. Further appendages are found on the abdomen, with each segment capable of carrying a pair of biramous pleopods (swimming legs or swimmerets), the last of which form part of the tail fan (together with the telson) and are called uropods. The body of shrimp is compressed from side to side and the antennae and legs are long. Shrimp tend to have a semitransparent exoskeleton, which like other arthropods, must be molted as the animal grows. It is typically thinner than other crustaceans. Shrimp are adapted for swimming, using their swimmerets to move forward or moving rapidly backward by flexing their abdomen and fan-like tail. While in biological terms prawns are of a separate biological suborder of Decapoda, there is much confusion between prawns and shrimp, especially among non-specialists, and many shrimp are called "prawns" and many prawns are called "shrimp." Prawns belong to the sub-order Dendrobranchiata, while shrimp are placed in the suborder Pleocyemata (Burkenroad 1963). Prawns are distinguished from the superficially similar shrimp by the gill structure ,which is branching in prawns (hence the name, dendro meaning "tree," and branchia meaning "gill"), but is lamellar in shrimp. Pleocyemata is the sister taxon to Dendrobranchiata and contains all the true shrimp, crabs, and lobsters. Confusion is particularly widespread in culinary contexts. In commercial farming and fishery the terms shrimp and prawn are often used interchangeably. In European countries, particularly the United Kingdom, the word “prawns” is more commonly on menus than the term “shrimp,” which is used more often in North America. The term “prawn” is also loosely used to describe any large shrimp, especially those that come 15 (or fewer) to the pound (also called “jumbo shrimp”). Australia and other Commonwealth countries follow this European/British use to an even greater extent, using the word “prawn” almost exclusively. In Southeast Asia, the difference between shrimp and prawns also is based on size, with larger shrimp being called prawns (Solomon 1998). In various forms of English, the name “prawn” is often applied to shrimp as well, generally the larger species, such as Leander serratus. In the United States, according to the 1911 Encyclopædia Britannica, the word “prawn” usually indicates a freshwater shrimp or prawn. Shrimp is one of the most popular shellfish, called by Herbst (2001) "America's favorite shellfish." Recipes using shrimp form part of the cuisine of many cultures—examples include shrimp kebabs, shrimp creole, shrimp gumbo, pan fried, deep fried, stir fried. There's pineapple shrimp and lemon shrimp, coconut shrimp, pepper shrimp, shrimp soup, shrimp stew, shrimp salad, shrimp and potatoes, shrimp burger, shrimp sandwich, shrimp fajitas. Strictly speaking, dishes containing scampi should be made from the Norway lobster, a shrimp-like crustacean more closely related to the lobster than shrimp, but in some places it is quite common for large shrimp to be used instead. Dried shrimp is commonly used as a flavoring and as a soup base in Asian cuisines, while fried shrimp is popular in North America. In Europe, shrimp is very popular, forming a necessary ingredient in Spanish paella de marisco, French bouillabaisse, Italian cacciucco, Portuguese caldeirada and many other seafood dishes. Shrimp are marketed according to size (albeit with regional variance), with general categories commonly including colossal (ten or less per pound), jumbo (11 to 15 per pound), extra large (16 to 20 per pound), large (21 to 30 per pound), medium (31 to 35 per pound), small (36 to 45 per pound), and miniature (about 100) (Herbst 2001). Colossal shrimp and jumbo shrimp are commonly called prawns in the United States, despite being of different taxa (Herbst 2001). 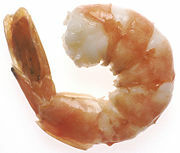 Shrimp and other shellfish are among the most common food allergens (FAAN 2007). Preparing shrimp for consumption usually involves removing the shell, tail, and "sand vein." To deshell a shrimp, the tail is held while gently removing the shell around the body. The tail can be detached completely at this point, or left attached for presentation purposes. Removing the "vein" (a euphemism for the digestive tract) can be referred to as "deveining," though in fact shrimp do not have any real veins; they have an open circulatory system. The "vein" can be removed by making a shallow cut lengthwise down the outer curve of the shrimp's body, allowing the dark ribbon-like digestive tract to be removed with a pointed utensil. Alternatively, if the tail has been detached, the vein can be pinched at the tail end and pulled out completely with the fingers. The shrimp is then rinsed under cold running water. Several types of shrimp are kept in home aquaria. Some are purely ornamental, while others are useful in controlling algae and removing debris (Anderson 2006). Freshwater shrimp commonly available for aquaria include the Japanese marsh shrimp (Caridina multidentata , also called "Amano shrimp," as their use in aquaria was pioneered by Takashi Amano), and ghost or glass shrimp (Palaemonetes spp.). 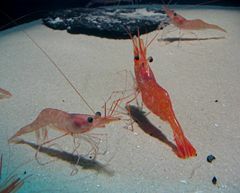 Popular saltwater shrimp include the cleaner shrimp Lysmata amboinensis, the fire shrimp (Lysmata debelius) and the Harlequin shrimp (Hymenocera picta). Anderson, J. 2006. Freshwater shrimp in the aquarium The Krib. Retrieved December 2, 2007. Burkenroad, M. D. 1963. “The evolution of the Eucarida (Crustacea, Eumalacostraca), in relation to the fossil record.” Tulane Studies in Geology, 2(1): 1–17. Dietary Fiber Food (DFF). 2006. Cholesterol content in seafoods (tuna, salmon, shrimp) DietaryFiberFood. Retrieved December 2, 2007. Food Allergy and Anapylaxis Network (FAAN). 2007. Common food allergens The Food Allergy & Anaphylaxis Network. Retrieved December 2, 2007. Solomon, C. 1998. Encyclopedia of Asian Food New Holland Publishers. Retrieved December 2, 2007. This page was last modified on 3 July 2008, at 01:22.